"Changer name web cameras" Is a unique program for lifting bans on popular internet video chat sites eg. Ome.tv, Random chat, Chatalternative, Omegle, Chatroulette etc. It can change the ID of your Webcam & Virtual webcams, also able to hide the presence of other webcam programs like Manycam, Splitcam & WebcamMax eliminating the black screen issue. It even has the ability to change network card mac addresses. Some of these functions are only for paid subscribers. Date of the program creation is August 17, 2014. 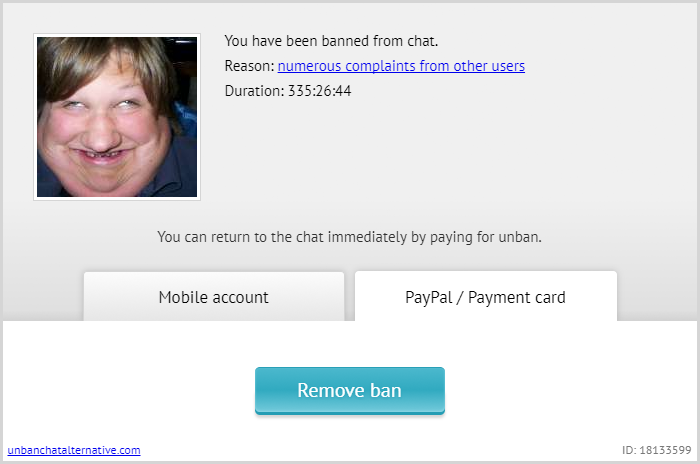 1 - Unban free is available 1 times in demo version of program. 2 - In full version of program is available unlimited unban chat alternative, hiding virtual web camera ManyCam in video chats, changing poppy network card address, choosing a browser for chat with saving browser settings. 3 - Improved algorithm of program, increased speed of loading and running program. 4 - Added a field showing your id. In case of technical problems of program, you can write through feedback form in technical support to solve problem by specifying your id. If you have any additional questions, please contact us via feedback form or by using online consultant button in lower right corner of site! This software product is conditionally free. We tried to make program as reliable, fast, productive and easy to use. Program does not contain any hidden or potentially dangerous functions. Software product is protected by copyright laws and international copyright treaties, as well as other laws and intellectual property treaties. Program is designed to be used solely for purpose of learning. Attentively study instruction which is in an attachment with program! How the program works changer name web cameras? How to unban yourself from video chat sites using "changer name web cameras". Many video chat sites generate a unique key for your computer based on your computers hardware via your browser and this key is then used when banning you. Now with this program your unique web camera ID is changed and hence a new key is automatically generated by the video chatsite and the result of that is your unbanning. The program works completely automatically, just launch program, click on button to change web camera ID, the program will close your browsers and do its thing. Once completed, it will restart your default browser and enter a video chat alternative or you can enter your own video site. Your web camera ID can be change an unlimited time with the paid version.In demo version, functionality is limited. → (Browser selection, Browser selection, SplitCam Detected, ManyCam Detected). Do not use a VPN & Proxy, otherwise triangle will not be removed. Why cannot my interlocutors see me in video chat? The first reason is that you may not have a proper internet connection, too little bandwidth available will cause video delay and black screens Second reason is that you tried to change various settings to unban yourself without this program to remedy that, use this program changer name web cameras. 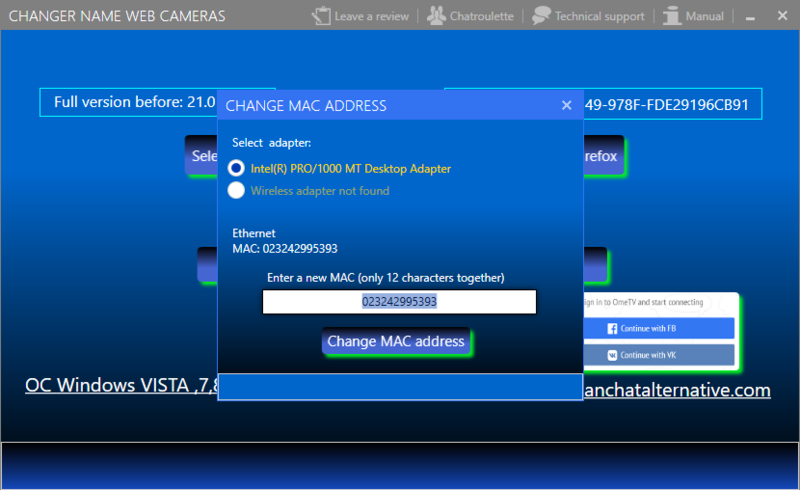 3) After about 30 seconds, MAC address will be changed, and network adapter will automatically reboot. Do not change Mac address without need, and if you still decide to change Mac, then save your standard Mac, so it was possible to return it back. Program requires Microsoft .NET Framework 4.0 or higher.